As if having to argue with China and Korea over rocks was not complex enough for Japan, a third territorial counterparty is (re)emerging in the form of Moscow. It seems like, since everyone else in the neighborhood wants to clarify territorial issues, the Russians are chiming in as well. This time, the tone is conciliatory, even though it does not come from the Kremlin. Dmitri Trenin, who directs the Carnegie Moscow Centre, put out a paper in December of 2012 proposing a mechanism by which four islands taken by the USSR from Japan at the end of World War II would be returned to Japanese control. Professor Hakamada Shigeki of the University of Niigata prefecture is cool to the proposal. While conceding that any such opening is worth pursuing, he is under no illusions about Trenin’s position (a Western-funded think tanker rather than a Kremlin insider) and Putin‘s continuing need to prove to Russians he is a strongman. To expect Russia to concede territory for nothing would be unrealistic. But Hakamada sees other wheels at work. China looms large for Russia (especially after Xi Jinping’s recent visit) but Putin will not want to close out other options in the region. Working out longstanding territorial disputes with Japan would allow Russia to play the conciliator in a Sino-Japanese standoff, and would keep Japan in the game as an alternate destination for Siberian natural gas. The source of the suggestion is Machiavellian. To have the suggestion come from the Carnegie Centre could be serving as Putin’s trial balloon, giving him a chance to judge Japanese reaction without committing himself publicly. The next move, as Hakamada hints, is Japan’s. It will be interesting to see how this plays out. Clearly, the diplomatic game is afoot in East Asia. This insight not only compelled me to look at my own life (which one am I? ), it also forced me to re-evaluate my heroes. Who among my pantheon was a doer, and who did some good things but was really exceptional at tooting his own horn (or paying others to toot if for them?) What does it say about an individual who crafts his or her life after one type or the other? And what does it say about nations that make heroes of narcissists? Admiral Ernest J. King, the Chief of Naval Operations in World War II, thought Raymond Spruance was the single most intelligent U.S. naval commander in the war. Given the competition – Nimitz, Turner, Halsey, McCain, Leahy, and King himself – this was high praise. Yet Spruance today is largely unknown outside of the relatively small circle of mariners, historians, and history buffs. Why? Thomas Buell, himself a naval officer, offers an answer with his definitive portrait Spruance, the enigmatic commander who made the critical decisions at Midway and led the US Navy-Marine Corps team in their legendary drive across the Central Pacific. Throughout his life, his subordinates and superiors all came in turn came to rely on his quiet intellect, his preternatural calm under fire, and his ability to size up a situation and act with deliberation, neither vacillating like Ghormley nor impetuous like Halsey. Working from a relatively small number of sources on Spruance, Buell gives us no great insights that will change the way we think of war, but it will change the way we think of warriors, their flacks, and their biographers. Buell paints a credibly human picture of Spruance, and rather than inflate him to larger-than-life size, offers us the spartan, taciturn, stone-faced career officer whose deeds remain greater than the man himself. It would have been easy for the author to write a panegyric, but you can almost hear the ghost of Spruance whispering over his shoulder, telling Buell not to go down that path. While ably defending Spruance against criticism of his actions at Midway (later proven to be correct), Buell uses the same historiographical care to excoriate the admiral’s actions during his tenure as Ambassador to the Philippines. Buell also points out more sublime examples of Spruance’s leadership that resonate today. 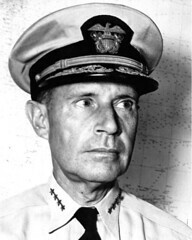 Spruance led his fleet with a staff that was a fraction of the size of Halsey’s, demonstrating an economy that the brass-bloated navy of today has forgotten: he was early to recognize and defend geniuses like Kelly Turner and Carl Moore against the capricious politics of the Navy; he was a battleship officer who never learned to fly, yet absorbed so much about carrier aviation that he became one of the country’s ablest commanders of airpower; he oversaw the reinvention of naval logistics, a factor the Japanese navy recognized as the keystone to the US victory in the Pacific; and he grasped early that American bases in postwar Asia would be an irritant that would lead to further conflict. And then there was that intellect: rebelling against the provincial, trade-school approach the navy had taken to professional education, he spent the last years of his career turning the Naval War College into an outstanding graduate school with unparalleled programs in strategy, national security, and world affairs. While nothing he did will surpass his feats as a commander, in terms of its importance to the nation, to sea power, and to global security his two years as President of the College are unmatched. Buell also offers us an illustration as to why, seven decades after the end of the conflict, we are still unearthing truths that compel us to reevaluate how we understand the war, history, power, and leadership. As we do, we are finding that many of the lessons our fathers learned from their victories are wrong, and many of the right lessons have been forgotten. The time has come for a reappraisal of that conflict: as we watch the rise of a new set of world powers, now more than ever we need to understand why World War II was won (or lost), and we need to find the people who were really responsible, not just the heroes and villains our fathers’ textbooks served to us. Raymond Spruance offers us a timeless model of leadership in crisis. We would be wrong if we did not go looking for more. For nearly three generations in the west, and in the Anglophone countries in particular, we have been given a narrative of World War II that focuses on the contributions of the United States and Great Britain to the defeat of Nazi Germany. After a lifetime of this narrative, it is not unreasonable to believe that the war was won by England and America. That belief tends to cast the Russian Front and the China-Burma-India Theater as little more than diversionary sideshows to the core campaigns of the conflict. Little doubt this was reinforced by the prejudices laid upon our interpretation of history by the Cold War. It is, after all, impolitic to grant your enemies in your present conflict the credit for victory in the last. Since the fall of the Wall in 1989, we have been engaged in a celebration of the “Greatest Generation” of Americans, Britons, and Australians who fought that righteous conflict. The contributions of the Russians, largely ignored during the Cold War, was all but forgotten by the generation that came after. I was a victim of this collective epidemic of amnesia. A lifetime study of the war my father’s generation fought has left me with a fair appreciation of the Pacific War from the perspective of the U.S. Navy; of the Battle of the Atlantic from the perspective of the Royal Navy; and the fight in Europe from the perspective of the U.S. Army (in particular, Patton’s Third Army.) I say this not to apologize, but to suggest that the scope of the war was so great and the literature so vast (including a trove of government documents declassified only recently) that it is possible to lose the wider perspective. When the Cold War ended and the Iron Curtain fell, the time had come for the psychological curtain to come down on the history as well. The Russian Front has now emerged from the realm of the scholarly to the realm of popular history, allowing a wider, balanced reconsideration of the role played by the Soviet Union in Germany’s defeat. Unguided, the newcomer to the study of the Eastern Front will quickly fall into a deep rabbit hole. The story of Stalin’s war against Hitler, begun in hubris and betrayal and ended 46 months later in vengeful retribution is so vast and deep that it invites a lifetime of study. Fortunately for those of us unable to afford such a commitment, three authors have created a superb overview of the Russian theater that will either satisfy the casually curious or entice the serious scholar into deeper study. The risk of trying to capture the conflict in a single volume of popular history is that important though seemingly peripheral events will be left out. But two of the U.S. Army’s most distinguished military historians, Colonel David M. Glantz and Lieutenant Colonel Jonathan House manage to offer a thorough and engrossing narrative that serves as the ideal primer on the war in the East. Experienced instructors of undergraduates, Glantz and House know their audience, readers who want an overview of the war and plenty of maps to put a litany of unfamiliar places into comfortable context. The authors break some new research ground, but perform yeomen’s service in delivering a history with enough detail to provide understanding without getting us immersed in detail. 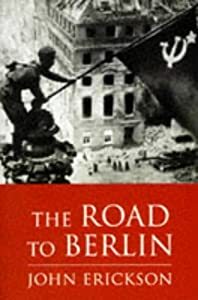 Glantz and House leave the reader thirsty to know more, and the next (and best) step is John Erickson’s authoritative two-volume history, The Road to Stalingrad and The Road to Berlin. In what is perhaps the single best account of the Eastern Front, suited for popular readers and scholars alike, Erickson offers less a military blow-by-blow than a social history of the conflict from the Soviet point of view. Erickson’s achievement in research, conducted when the Cold War was at its height, would have been challenging to duplicate in today’s more open environment – it was a work of genius at the time. His greatest accomplishment, though, is in his restraint: Erickson manages to give the Red Army the credit it is due for its role in the war without creating a panegyric. At the core of Erickson’s telling is the man FDR called “Uncle Joe,” who emerges over the course of the books as a Machiavellian thug possessed of just enough intelligence and raw cunning to save the Soviet Union and himself after his hubris and ruthlessness placed both on the cusp of oblivion. Hitler, for his part, had co-opted the German officer corps and let them forge the Wehrmacht into the most powerful armed force the world had seen to that point, all in less than a decade of Germany’s repudiation of the Versailles Treaty. Stalin, by contrast, had by the time Germany turned on the USSR reduced the Red Army’s leadership to little more than a corps of incompetent sycophants who commanded an army utterly unprepared to fight a modern war. Without belaboring Stalin’s error, Erickson shows us how a tiny handful of capable Red Army officers who had dodged the worst of the purges (led by G.K. Zhukov and I.S. Koniev) were joined by heretofore overlooked leaders who distinguished themselves in battle (including V.I. Chuikov, the savior of Stalingrad, and P.A. Rotmistrov, arguably the Red Army’s best tank commander) rallied demoralized, ill-equipped, and ideology-crippled Red Army after eighteen months of defeat and retreat. Their first victories were internal. With the Germans at the gates of Stalingrad, “The Boss” relented and allowed Zhukov to unify the Army’s command structure and relegate the military commissar’s role to that of an indoctrination officer. A seemingly small change, this opened the door for the Red Army to fight the war on military terms and make decisions on weapons and doctrine for purely military reasons. It was a very near thing. Yet Stalin was the quintessential control freak, and his institutionalized tool for micromanaging every aspect of the war’s conduct, the Supreme High Command (Stavka), was proof that while Stalin would give his commanders some leeway, their ropes were short. Indeed, Stalin arguably involved himself as much with his battle conduct as Hitler did. But after a year-and-a-half and a swathe of blood and destruction from the Bug River to the Vistula, Stalin had learned to give his better generals the benefit of the doubt. Still, earning even that modicum of trust was not easy for Uncle Joe, and he delegated only when detail became too overwhelming. Erickson does not venerate the Red Army marshals, even the best of them. To the very last, even when better weapons, hard-won lessons, and the preponderance of forces offered opportunities for tactical innovation, the leaders of the Red Army remained as careless with the lives of their own soldiers as they were with those of the enemy. Arguably Leningrad, Sevastapol, the Moscow campaign and the battle for Stalingrad were desperate battles where the only choice was to win by bloody attrition. To suggest that the Red Army was in such straits as it prepared to launch the final battle for Berlin in 1945, though, is ludicrous. Yet Zhukov, who remains the most venerated Soviet commander of the War, turned Seelow Heights between the Polish Frontier and Berlin into a meat grinder, and the last two weeks of the war cost the Red Army a quarter of a million lives. It is, perhaps, as much a testament to the heavy hand of the Stavka as to the hard-headedness of Soviet commanders that a revolution in battlefield doctrine would have been seen as a counterrevolutionary act. The average Soviet soldier paid the price for such orthodoxy in blood, right up to the moment of German capitulation. The individual soldier of the Red Army and what he indured for Stalin’s ultimate victory is the subject of Catherine Merridale’s superb oral history Ivan’s War: Life and Death in the Red Army 1939-1945. Merridale has done historians a remarkable service capturing the memories and memoirs of Russia’s own Greatest Generation while at least a few of that generation remained. The story she assembles compliments Erickson’s in that she tells the story from the point of view of the average Ivan. She makes no apologies for the often atrocious extra-combat behavior of Soviet soldiers. Yet in describing their backgrounds, their hopes, and the psychological effects of living in the early years of the USSR, she offers us a chance to understand what turned these otherwise unassuming peasants into remorseless marauders. What is more broadly relevant, though, is how so many of these (mostly young) soldiers believed that the end of the war would mean a better life than before. Somehow, reading into the promises of Party propaganda, most of them felt that greater freedom and prosperity would be their reward for the sacrifices they and their mates had made for Comrade Stalin and therodina.They certainly deserved as much. Without denigrating the contributions of the Yanks and the Tommies, it is fair to say that Ivan, his willingness to endure the worst possible conditions, the strongest imaginable enemy, and officers prepared to sacrifice him by the tens of thousands, was the single decisive factor in the war against Germany. Ivan may have achieved little more than a chance for survival via victory. Stalin, however, had every intention of exacting from Europe and the world the fullest possible payment for Russia’s blood and devastation. From the moment the Red Army turned Stalingrad into a German rout, Stalin began a campaign to permanently neuter Germany and turn the Soviet Union into a hegemonic power. Erickson in particular weaves into his account the story of how Stalin systematically undermined every government-in-exile in Europe (save Greece and France), how he crafted his own proxies, and how he bullied the rest of the Allies into accepting a fait accompli even as the NKVD “disappeared” entire delegations of exiled Polish leaders. With a 19 page summary of the Yalta conference, Erickson makes it clear that Roosevelt and Churchill were neither conspirators nor dupes. In war as in business, Erickson’s account suggests, possession is nine-tenths of the law. Short of taking Eastern Europe back by force, there was no way Stalin was going to give an inch more than suited him. As much as in the diplomatic salons, Stalin made sure that every move on the battlefield reinforced the Soviet Union’s claim on postwar hegemony. Stalin insisted that the U.S. and British armies stop cold on the previously-agreed demarcation lines across Germany, even though the Allies were prepared to storm across Europe and could have met the Red Army much farther east (on the line Prague-Dresden-Berlin) and ended the war as much as a week sooner. Stalin preferred to bleed Germany – and the Red Army – for as long as it took to ensure he was not going to have to ask the Allies to give up anything that they had taken. General Patton, somewhat less in awe of Soviet ambitions than his superiors, let the forward reconnaissance elements of his force get all the way into the suburbs of Prague, two days before the Soviet 13th Army reached the same point. Stalin pressed the Allies, who pressed Eisenhower, who told Patton to withdraw. U.S. soldiers returned home to 52 weeks of paid vacation and an opportunity to attend university at government expense. Ivan did not do near as well. Joseph Stalin, for his part, won an empire that just outlasted him and marked the high-water mark of Russian civilization. Whether the cost seemed dear to Stalin the world will likely never know. If there is an enduring lesson in the course of Stalin’s war with Germany, it is that the cost in national treasure and blood of a politicized army is prohibitive. Ideology and military necessity are uncomfortable bedfellows in the best of times, and utterly incompatible in the crucible of combat command. The salvation of the Soviet Union was a very near thing, so much so that it is arguably an even more powerful legitimizing myth for Russia than the Revolution, much in the way the Civil War serves as an historic vindication of America. The price to Stalin of political conformity in the military was almost the existence of the USSR itself. China will likely face no such existential moment, no matter how poorly its forces perform in the field: possession of nuclear arms guarantees as much. Whether a Chinese government could remain legitimate in the eyes of its own people after the rout of its conventional forces is another matter altogether. China is betting on force structure, diplomacy, and bluff to ensure against such an eventuality. But the politicization of the force and its doctrine remains a weakness that would inhibit battlefield performance at every level. It seems, though, that the PLA will be no more able to exercise this problem in advance of combat than the Red Army was seven decades ago.